So, who the heck is Jerry and why does he meander? I know, bad pun. Actually, the phrase is not one that came into being within the last 50 or so years. The term was coined via Elbridge Gerry, our fifth vice president and former governor of Massachusetts in 1812. I thought for years that it was invented by one party only, but no. Both parties used it, but now it seems that one party has usurped it for their own advantage. So, gerrymandering has been around since George and the boys conceived our Democracy. Shortly after Gerry passed the manipulated zoning into law, the new districts he had created caused quite a stir with the fifth estate. The writers at the Boston Gazette compared the shape of this new district to that of a salamander. 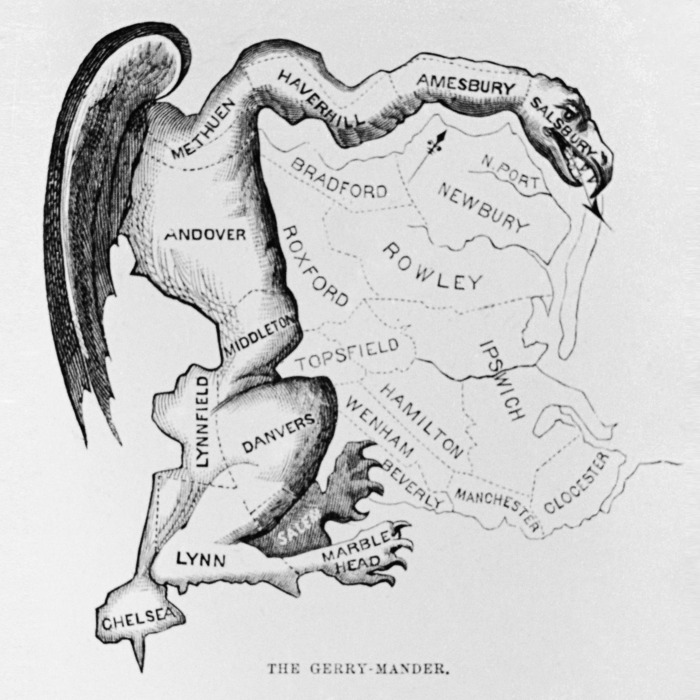 They actually created the name “Gerrymander”, although the practice of altering boundaries for political advantage was already widely used. You can see their rationale in the attached art from the Gazette archives. Gerrymandering is “a practice intended to established a political advantage for a party or group by manipulating district boundaries.” Through this manipulation, the size and shape of an electoral constituency could be used to favor one party or class. What many of us do not realize is that these gerrymandered districts are determined by our census results. So now we have another issue (not for this article) to contend with; where new schools are needed, which roads (infrastructure) should be improved or relocated, housing projections, agriculture, business, traffic and its patterns, for starters. Once again Colorado leads the pack in attempting to redistrict through a process called Fair Maps. This initiative would transform the way redistricting for congressional and state legislative districts in order to prevent gerrymandering. These radical initiatives would take the power of redrawing districts away from the ruling party and ensure those districts are drawn fairly which means in a manner that leads to more competitive races. The committee for this initiative involves: Kent Thiry, CEO of DaVita, Inc. and co-chair or Fair Maps Colorado; Toni Larson, President of the League of Women Voters of Colorado; Heidi Ganahl, University of Colorado regent; Joe Zimlich, CEO of The Bohemian Group; and State Senator Bob Gardner (R). “This is about fairness, it’s about holding our elected officials accountable, and it’s about proportional representation, the ‘sacred principle’ of democracy,” Thiry said. In most states legislators draw the district boundaries that determine how many delegates the state sends to the U.S. Congress, as well as the general partisan make-up of that delegation. State legislatures are partisan “beasts”, and if one party is in control of the process, they can draw boundaries to give themselves a numeric advantage over their opponents in Congress. The next redistricting will be done after the 2020 census. So it is vital the we have Democrats in the Texas legislature to prevent further gerrymandering. If we get enough Democrats in the legislature, we can even draw fair maps. Vote Democratic in November!